American Ninja Warrior | Keep It Up, David! 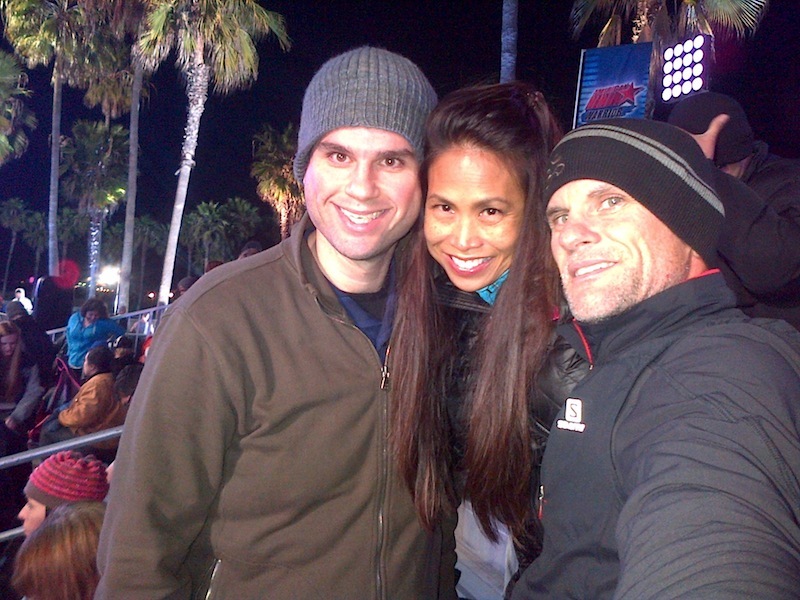 Have you seen American Ninja Warrior? It’s one of my favorite shows. It airs on NBC during the summer, as well as the new Esquire network (it used to air on the G4 network). The show features athletes from around the country competing to make it through a series of extremely tough obstacle courses, each one harder than the last. 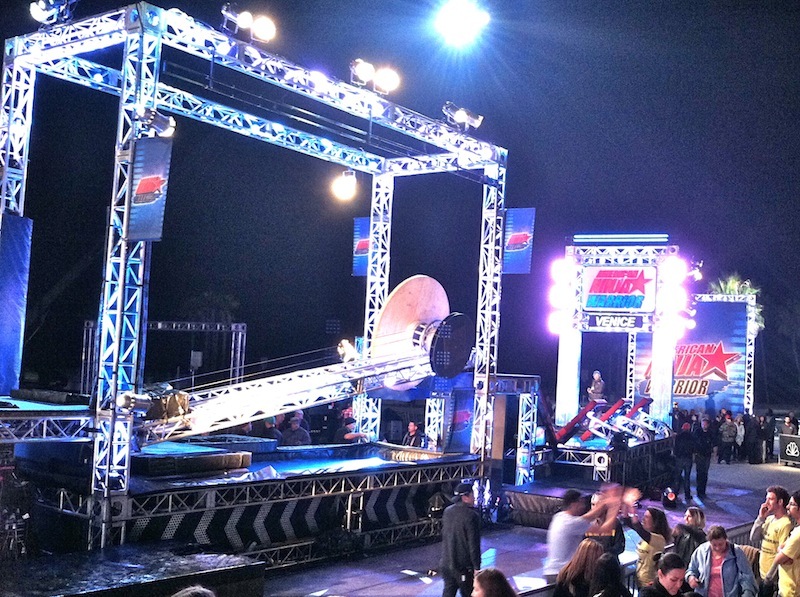 Whoever makes it through all of the courses with the best time wins $500,000 and the title of “American Ninja Warrior.” The courses are so difficult that, in the five seasons the show has been on, no one has ever won. But damn, it’s fun to watch them try! This past weekend, the preliminaries were held in Venice Beach, and my buddy Tommy had made it on the show and was going to compete. 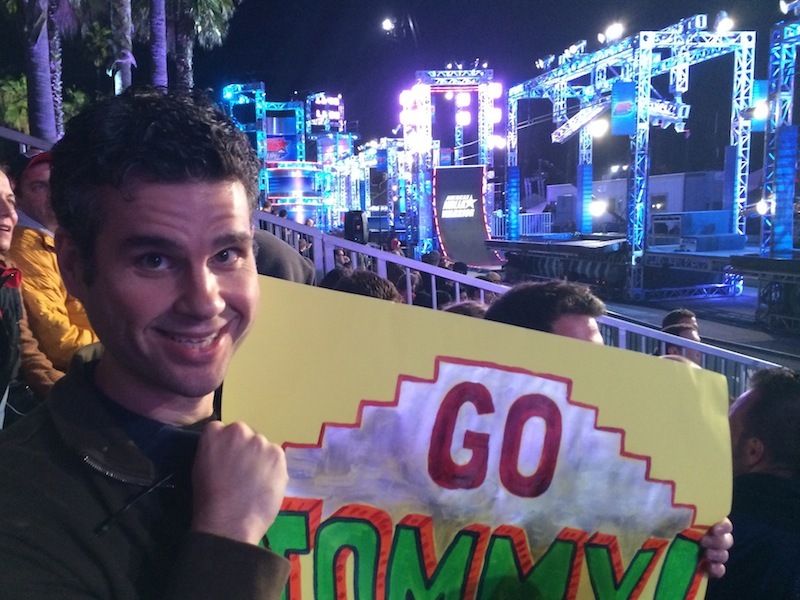 Since I’m a huge fan, I met up with some friends to cheer Tommy on from the audience (and maybe be on TV!). It was an all-night shoot, and we met up at 10:30pm. 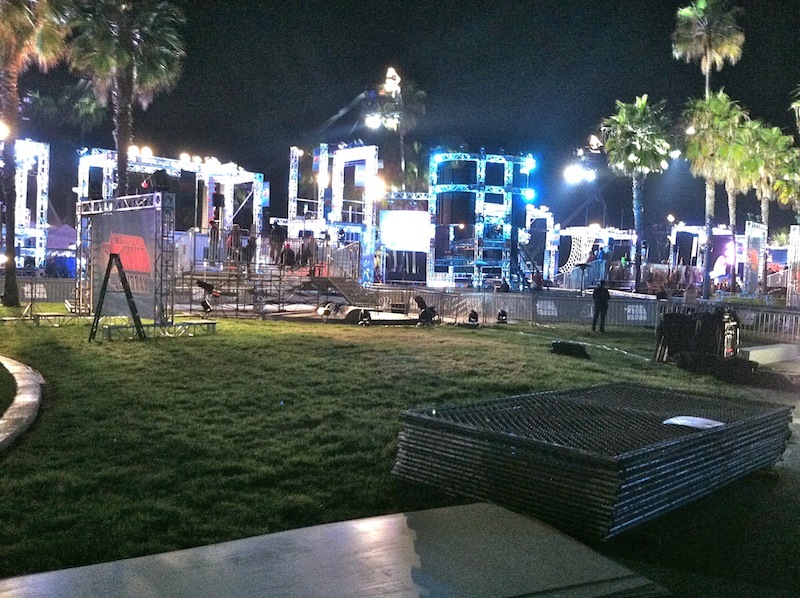 American Ninja Warrior had basically taken over an entire block along the Venice Beach boardwalk, and the set was beautifully lit up from all angles. We were “friends and family” of a competitor, so we checked with the audience coordinator… and then the waiting began. Audience members had started showing up hours before, and we couldn’t go into the bleachers until some of them left. Furthermore, Tommy was #83 on the list of competitors, so it was going to be a while before he competed. There was a lot of waiting. We arrived at 10:30pm, and Tommy didn’t end up racing until around 5:45am. During the hours and hours in between, we cheered on other competitors, chatted with each other, made new friends with the folks around us in the bleachers, and tried to stay warm. Behind us was a big group supporting a competitor named Erin, so when it was her turn, we borrowed extra signs and cheered like crazy. Likewise for Kate Hansen, a Sochi luge Olympian, whose parents were one row back, and Travis Brewer, an American Ninja Warrior veteran whose cheering group was right in front of us. And show producers sent a cameraman to film us cheering on these athletes, so I might get a second or two of air time when this airs! My friend Jeff took this selfie of him, me, and our friend Madeleine at 5am… we were getting amped, because we knew Tommy was coming up soon! I met Tommy last year through stair racing – he came in first place in the US Bank Tower race (setting a course record in the process), and he’s a focused, intense, accomplished athlete. All the dudes that compete on American Ninja Warrior (there are some women, but it’s probably 90% men) are in top physical shape, and it’s pretty inspiring. I’m nowhere near being at the level required to compete on this show. I don’t have the upper body strength, agility or endurance that’s needed. But I enjoy watching people who have spent literally a year (or longer!) training for their chance to complete on a two-or-three minute obstacle course. It’s motivational to see what they can do, and while I may be far from doing what any of these guys can do, it does fuel me to push myself a little harder in the gym, and try to go a little longer on the stairs. This show exemplifies the idea that hard work pays off, and that’s a message I don’t mind hearing again and again. We left the beach around 6:30am, and headed to Denny’s for breakfast, which for me was an egg white veggie scramble. I didn’t get home until close to 8:30am, and then, it was naptime. Saturday was a rest day (I planned it as such, knowing I’d be up all night the night before), but on Sunday, I returned to the gym to start a whole new week of working out. PS – Don’t forget to enter my Siggi’s yogurt giveaway – click here for details! This entry was posted on Wednesday, March 19th, 2014 at 12:01 am and is filed under Uncategorized. You can follow any responses to this entry through the RSS 2.0 feed. You can leave a response, or trackback from your own site. Loved reading this David! Thank you! I haven’t watched American Nija Warrior…but I have seen a lot of the original Japanese version…I love it! I will now be tracking down the American version…they must show it in the UK! I hope they do show it in the UK! Or maybe there’s a UK Ninja Warrior! I FREAKIN’ LOVE ANW!!!!! That is so awesome! Haha try not to be TOO jealous, Nathan! It WAS cold. And stupid me left my scarf in the trunk.